Catholic Charities of the Twin Cities says it's halfway toward funding a $100 million center for the homeless in downtown St. Paul. The charity plans to replace the Dorothy Day Center, the 34-year-old shelter that cannot handle the numbers of people seeking shelter. The plan will initially build a five-story shelter nearby that can provide overnight accommodations to nearly 300 people and long term housing for nearly 200 more. The effort includes a $40 million private fundraising campaign led by executives from Ecolab, Health Partners and U.S. Bank, which has made "tremendous progress," said Catholic Charites CEO Tim Marx. 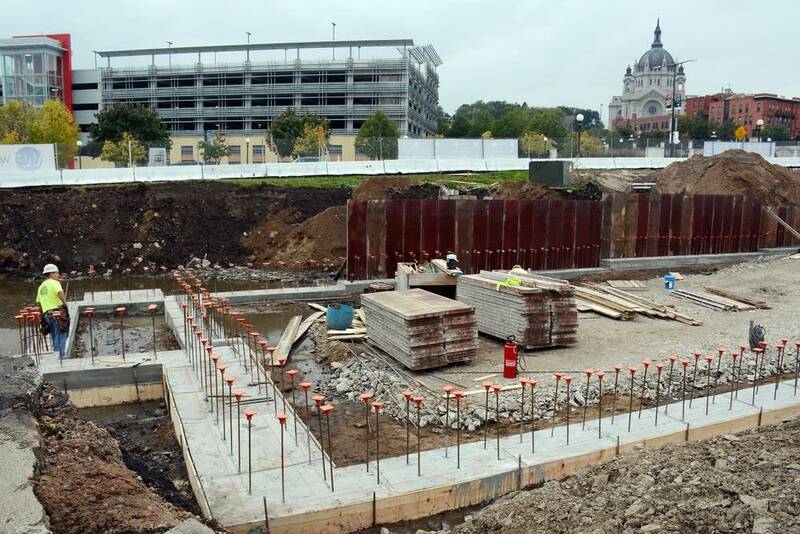 Marx says the charity was officially marking the groundbreaking today for its so-called Higher Ground St. Paul project, a successor to a similar shelter in Minneapolis. St. Paul Mayor Chris Coleman said he welcomed the development. "The way that we have handled folks is just not dignified, it's not an appropriate space," Coleman said. "The center itself was never set up to be an overnight shelter, it's just really supposed to be a daytime drop-in. And all of the sudden we had hundreds of people sleeping on the floor, and that's just not right, and we knew we needed to do something about it."